I have thoroughly enjoyed the first two books in this series. There were really cute and sweet looking designs of mice and others who lived in the village. When I received this book, it was quickly evident that it was more unusual. It didn’t take long for me to figure out why. The artist behind this book is Forest Diver. I really like his designs and was first introduced to them in the Enchanted Forest series by the same publisher. The other books in the village series have not included an artist’s attribute but they have a very different look and feel to them. 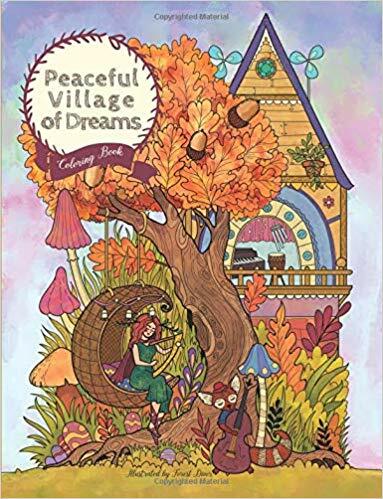 Mr. Diver has created more creatures for this third book in the Serene Village series but they are in more of his trademark and more elegant style. Some of the creatures in this village are creatures I recognize from the forest. And that is all fine with me. It seems to be more of the forest series but I’ll accept it as a village entry. I like both series and see this book as a happy meld of them together. 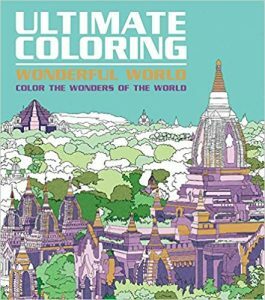 As I have found with other coloring books in this series, the designs are from a team of designers as well as many open-stock images as well. The designs are from Shutterstock, Jill Tytherleigh, Lydia Coventry and Sophia O’Connor. The book is based on a story version of The Nutcracker and not on the ballet. I like that for a change of pace. The other coloring books I have found have been based on the ballet. The images are lovely but I found that there was a serious use of wall-paper designs and the use of open-stock images were easy to recognize. 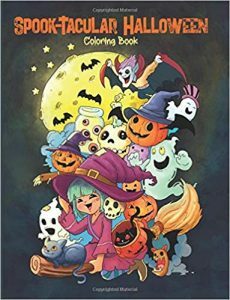 I like the coloring book It is a slightly square format and has a spiral binding on the side. The images are crisp and clear and the pages are perforated for easy removal if you care to do so. 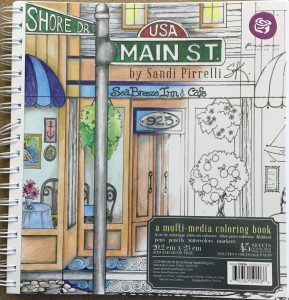 I like small town looks in coloring books and that is what I find in this one. The designs have good detail but are not too intricate to color. I especially like that there is a framing line around the images which stops short of the perforations, so if you remove a page, you don’t leave behind part of your colored design. I had not read very far into this book when I realized why the story line was so familiar. It is the same story as that of “You’ve Got Mail”. If this wasn’t done intentionally, I can’t explain the similarities. Everything from a young woman with an inherited business going under to a conversation between strangers carried out over email. Just as with the movie, the story was fun and heart-warming. The two main characters have good impressions of each other when they spy one another from afar. When they find out who the other is, prior prejudices take over. 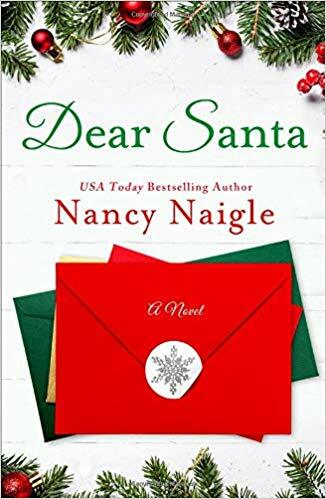 The story is set at Christmas time and the title points to one my favorites parts of the story. Each chapter is begun either with a bit of history of their town or, more fun, letters from children to Santa. Those letters made me laugh more than once. This is a book of 47 designs which are of famous places and buildings, etc. from around the world. I liked the concept and the paper used but what I found to be an issue (for me) was that the details of many of the designs was really tiny making it difficult for me to see or to use a color medium that worked well. If that is not a problem for you, then you may very well love this book. 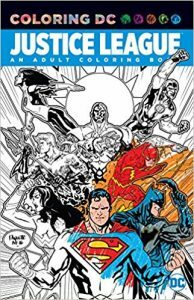 For me, it makes a portion of the book either usable or something I have to color in less detail than I would ordinarily prefer. It’s really nice to have an explanation of which city et al the design is of and some of the history behind it. Unfortunately, that information is printed on the preceding page, i.e., the back of the design in front of it. If I take the pages out, I lose continuity of the information with the design. That makes the perforated pages a little less meaningful for me. 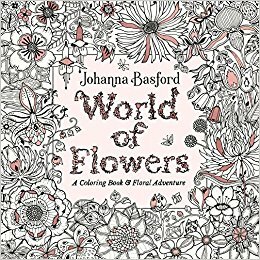 “World of Flowers” is yet another beautiful coloring book by Johanna Basford. With flowers as a theme, I found that there appears to be much less use of green (or as I like to call it, 50 shades of green because it could get painful coloring that much green and using all of my green pencils up on one coloring book.) There is a page or two with lots of fuchsias which are one of my favorite flowers to grow. Even though this book has less design pages, I like it better than “Magical Jungle”. That’s a personal choice because I like flowers more so than cartoon jungle animals. As usually, there are some designs with a large amount of detail and others with very little on the page. The ones that are mostly empty are great for individuals who like to add their own unique touch and designs in their coloring. Again, there are areas which have small and intricate areas to color. That is par for the course with Ms. Basford. I would be surprised if it weren’t so. 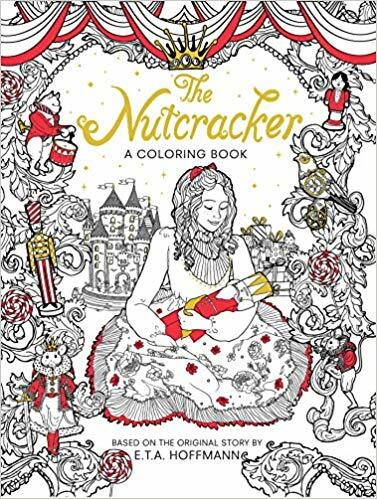 As with her most recent coloring books, there appears to have been a concentrated effort to reduce the elements which span across the binding if the page is one of the few two-page spread designs. In my book, the pages line up well. The paper is the same color as in “Magical Jungle” which is an ivory but it is different from my older coloring book by Ms. Basford (which is more of a cream color.) Once again, as with “Magical Jungle”, seems to me that the paper has a smooth side and a slightly rough side and that it alternates in my book. The paper is heavyweight in nature. The cover is attached and has light pink foil highlights. The inside of the front and back covers have French folds (partial fold-outs.) There are color palette test pages at the back for testing your medium to see what seeps through or not. This is an interesting Halloween coloring book. It is portrayed as a book appropriate for kids but because of the “creepy” factor of what many of the cute elements actually are in the illustrations, I would caution you not to give it to younger kids. See for yourself and make your own judgement for the kids in your life. The designs are done in a cute style and I will enjoy coloring it. 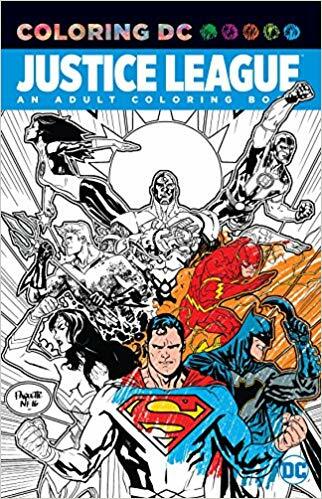 I originally bought it thinking my five year old grandson could color in some but after actually seeing it, that won’t do. Good thing I like it for myself! The little creatures remind me of doodle creatures and as I enjoy coloring those, these are fun for me. There are groupings which include vampires, witches, ghosts, skeletons, zombies, monsters, death, gravestones, and much more. Sounds fun, right? The designs are detailed but not overly so. There are no framing lines at the edges but the design elements are all finished within the page. 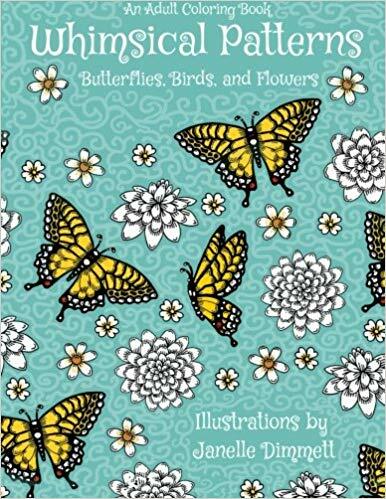 I have another coloring book by this artist and another one on the way. I enjoy coloring manga characters and Christopher Hart is one of the better artists with respect to this type of characters in coloring books. The backgrounds are there only as a backdrop to the girl, so the repeating patterns there don’t bother me. I can either choose to make them fade away using monochrome colors or bring them to life with bright and contrasting colorings. The girls are the “thing” in this book and they are really well done. 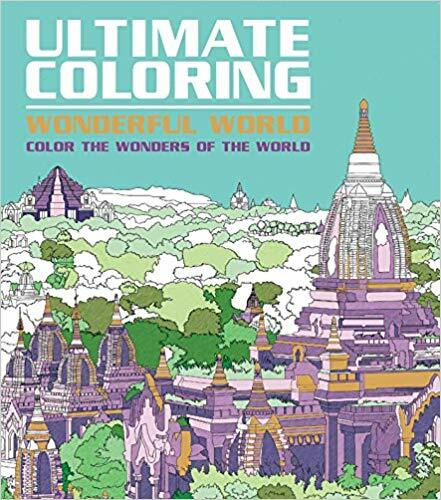 My husband likes to color this style of book as well, so either a tug-of-war ensues or we each buy our own book. This is one where we had to get two. The designs are detailed because of those backgrounds. 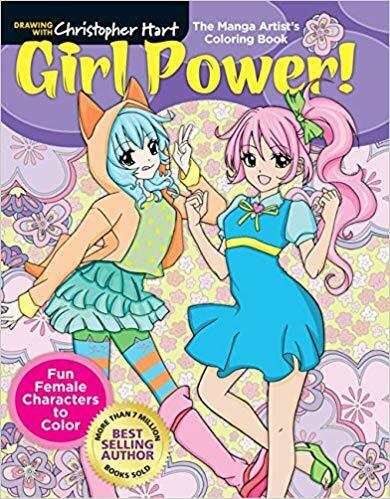 Otherwise, the girls are fun and fairly easy to color. I hope Mr. Hart continues to bring his artwork to coloring books in the future. I now he has a Christmas Chibi book that is winging its way to me as I write this. Look for that review soon! While the paper is night and day different from each other, the designs are still the same quality from this artist. There are lots of flowers and butterflies, some birds, landscapes, etc. The only complaint that I have is that some of the pictures seemed to have been scaled wrong for the page. In one, both edges of a bouquet of flowers are cut off just before their edge. The image would have had to been smaller to fit on the page but I would have preferred it that way. This book has Janelle Dimmett listed as illustrated and has Francis Keene co-listed. I’m not sure what Ms. Keene’s part in the book is, perhaps as a small publisher who handled the transfer? Other of Ms. Dimmett’s independent coloring books do not list Ms. Keene. The designs are detailed and some have intricate and small areas to color. A good number of the designs continue to and are cut off at the page ends. For me, at least, that makes it a little more difficult to color as I can’t get the same pressure on the edges that I get elsewhere on the page. This is a black and white version of comic book pages. It is printed on both sides of the page. There is a heavy use of black, so if I color with a lighter pencil, I have to be sure to either not color over it or color over it all. It’s fun to be able to choose between coloring the characters as envisioned by DC Comics or to go my own way. I generally go for the latter as I like to have fun with my projects. I can choose to put Batman in purple, or Wonderwoman in pastels. It becomes my own vision at that point. The designs include detailed areas and some are a bit intricate. 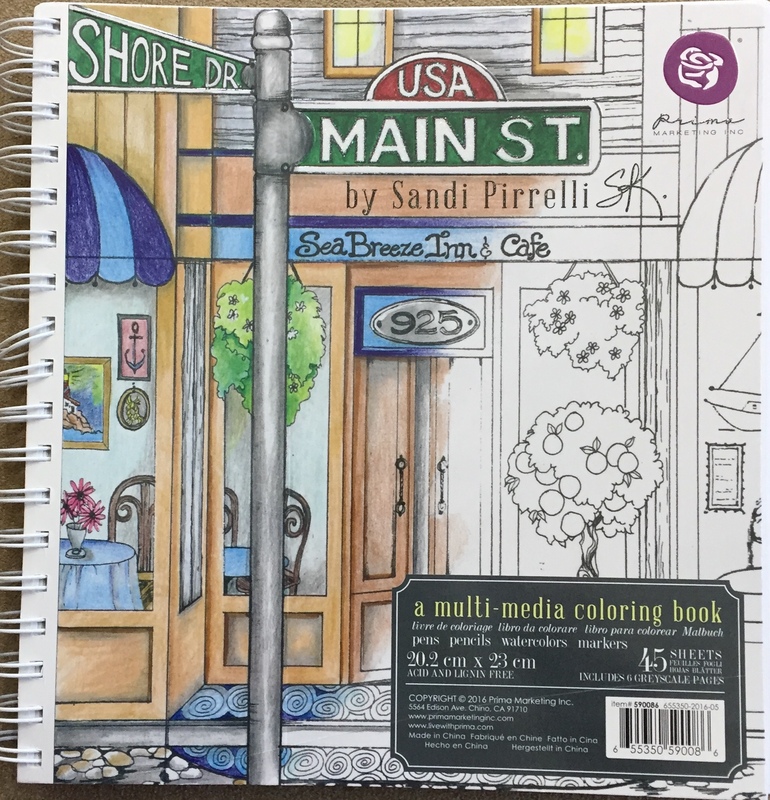 I will be using color pencils as it is the only way to ensure that color from the front of the page doesn’t mar the back of the page.